When My Three Sons premiered in 1960, it wasn’t the first TV series to feature an all-male household—Bachelor Father and Bonanza were both lacking mother figures—but it was the first to show a more realistic version of such a family. The house wasn’t always spotless, the boys were rambunctious and noisy, and chaos was often the order of the day. Here are a few fun facts (or “neat junk,” as Ernie might say) about the Douglas family. 1. THE STAR MANAGED TO NEGOTIATE A SWEET SET OF WORKING HOURS FOR HIS SCHEDULE. Fred MacMurray was a well-established film star when he was approached by executive producer Don Fedderson about starring in a TV series. MacMurray agreed with two conditions: one, that he would own a percentage of the show, and two, that he only would be required to work three months of each year. In reality, MacMurray was a dedicated family man, and after years of being away on movie sets had planned to retire early and spend the majority of his time at home with his wife and four-year-old twin daughters. But the money Fedderson offered him was too tempting to pass up—and would secure his children’s future—so he signed on to play the widowed patriarch on My Three Sons. 2. WILLIAM FRAWLEY WAS A BELOVED BUT NAUGHTY ROLE MODEL TO THE CHILD ACTORS. The premise of My Three Sons was to showcase the trials and tribulations of Steven Douglas (MacMurray), an aeronautical engineer and widower, and his three boys—Mike, Robbie, and Chip. Since Steve’s job required long hours, some household help was required. Enter William Frawley (I Love Lucy’s Fred Mertz) as Michael Francis “Bub” O’Casey, Steve’s father-in-law. Bub served as chief cook and bottle-washer, as well as the disciplinarian for the boys when their dad wasn’t home. 3. THE “SONS” HAD TO BE MACMURRAY-APPROVED BEFORE BEING HIRED. Stanley Livingston was the first of the “Sons” to be cast. Just nine years old at the time, he was already a show biz veteran, having worked regularly on The Adventures of Ozzie & Harriet from 1958 to 1960. Stan was hired to play “Chip,” who was the youngest of the Douglas boys when the series premiered. Ryan O’Neal was a contender for the role of Mike, the eldest son, but MacMurray felt that he wasn’t really suited to comedy. MacMurray instead recommended Tim Considine for the role, having recently worked with him on The Shaggy Dog. Former Mouseketeer Don Grady, who was cast as Robbie, not only passed muster as being well-behaved, he also had a cleft in his chin that resembled MacMurray’s. 4. BILL FRAWLEY CARRIED A GRUDGE … TO GREAT LENGTHS. That there was no love lost between former I Love Lucy co-stars William Frawley and Vivian Vance was certainly no secret in Hollywood, but Frawley had been willing to set aside any personal differences when Desilu proposed a spin-off series starring Fred and Ethel Mertz. Vivian Vance absolutely refused, however, and Frawley never forgave her for denying him a steady paycheck. 5. MACMURRAY WAS ALWAYS LOOKING FOR WAYS TO SAVE A FEW DOLLARS. 6. CONTINUITY PROVED TO BE A BIG PRODUCTION PROBLEM. Because the episodes and scenes were filmed out of order, the cast had to be doubly diligent about their appearance for each entire season. Any significant weight gain or radical haircut would completely blow continuity. Some changes were inevitable, such as Barry and Stanley’s growth spurts in their early teens, so the wardrobe department bought some of their clothes in duplicate sets in graduating sizes. The most obvious continuity glitch occurred during season 10, when Dawn Lyn was added to the cast as five-year-old Dodie, the daughter of the woman Steve Douglas married that season. Dawn was losing her baby teeth at the time, and her front teeth grew in irregularly so there are scenes of her chatting with her new daddy with a gummy grin and then later in the same episode she’s suddenly sporting a jagged pair of incisors while arguing with her brothers. 7. THE ELDEST SON LEFT THE SERIES AFTER A FALLING OUT WITH THE PRODUCER. Tim Considine had an extensive resume, having starred in many Disney shorts and feature films. After a few seasons on My Three Sons, he wanted to spread his wings and direct as well as act, but Fedderson dismissed the idea. The two had a serious falling out and Considine left the series at the end of the fifth season. His last appearance was in season six’s “The First Marriage,” in which Mike married his longtime girlfriend Sally (played by Meredith MacRae) and then moved to California to work as a teacher. A replacement son was needed after Considine’s departure, so writer/producer George Tibbles came up with a three-part story arc that involved Chip’s friend, an orphan named Ernie Thompson, moving in with the Douglas clan after his foster parents moved out of the country. After overcoming a few legal and emotional hurdles, Steve officially adopted the youngster and My Three Sons was once again a legitimate title. Ernie (played by Stanley Livingston’s younger brother, Barry) was now the youngest child in the family, even though in previous episodes he was the same age and in the same classroom as Chip. 8. THE SERIES CHANGED NETWORKS MIDWAY THROUGH ITS 12-YEAR RUN. 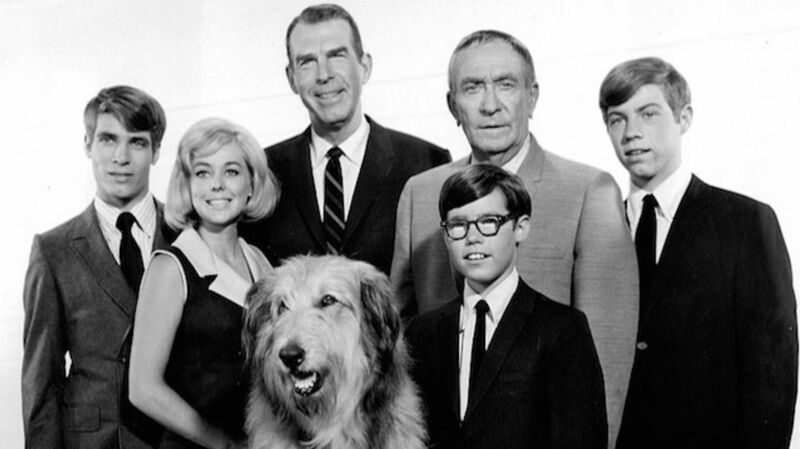 My Three Sons was effectively cancelled by ABC in 1964 because the network was bowing to pressure from rival networks and slowly converting their black-and-white prime time shows to color. All things considered, in their opinion the added expense of filming My Three Sons in color was not worth it, so they axed the show from their schedule. CBS, however, thought the series still had some legs so they picked it up for the fall 1965 season (and continued running it through 1972). 9. BOTH “ROBBIE” AND DON GRADY SERVED IN THE ARMY RESERVE. 11. A PROPOSED SPIN-OFF NEVER HAPPENED. During the 11th season of My Three Sons there was an attempt to spin Robbie, Katie, and their triplets off into their own series. In the episode “After the Honeymoon” (which also served as a backdoor pilot), Robbie was laid off from his job and moved his family to San Francisco to accept a new job. The apartment building that they moved into came equipped with wacky/overbearing landlords. The proposed spin-off series wasn’t picked up, much to Grady’s relief. He’d been ambivalent about the project from the get-go, having decided that he’d had enough of playing “Robbie” and acting in general. His true passion was music, and he longed to compose and perform his own songs. He left the series at the end of season 11, but Tina Cole returned; her husband’s absence was explained by having him transferred to Peru to oversee a construction job.